Posted 1 year ago on Friday, November 17th, 2017 by James S.
The Miata is going to get an engine swap soon. I’ve replaced the engine in this car before using only a floor jack and jack stands, but I really wanted a better way to get the car in the air this time. 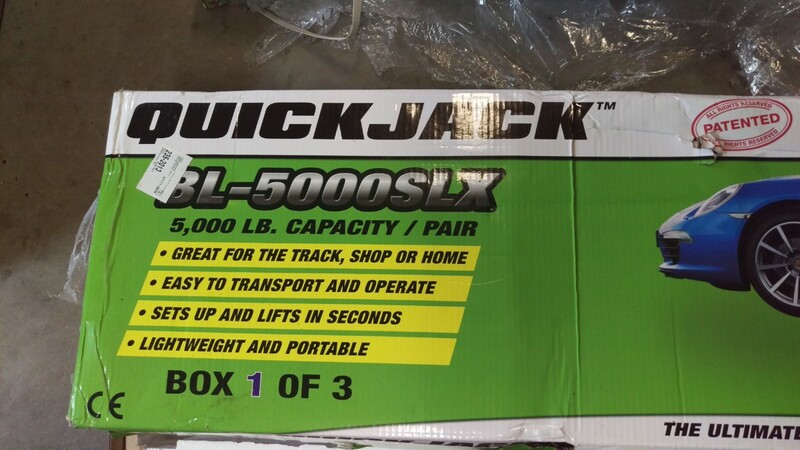 After looking at a bunch of options, I eventually settled a Quickjack BL-5000SLX . Thus, this Quickjack BL-5000SLX Review discussing this options vs the others available and how I like it. If you’ve already bought a Quickjack and want detailed help setting it up, I also wrote a setup guide. First things first, I’ll discuss the other options and why I discounted them. I’ll say this now: if my garage were tall enough for a full-height lift, I would have one. No question. They cost from $2000 to $6000 or so, depending on the manufacturer and whether you install them yourself. Once they’re installed, they’re the best. Sturdy, lift the car to standing height, just fantastic. One day, I would like to have one in a detached workshop. Unfortunately, you need a tall enough ceiling. My current garage ceiling is 10′ high, so that’s out. The title for this section is a bit hyperbolic, but I did take a look at the ezcarlift. essentially, it lifts about six inches higher than a Quickjack using a handheld drill instead of a hydraulic pump. No hydraulics and extra height are definite plusses. The cross bars also probably give a bit more lateral stability. 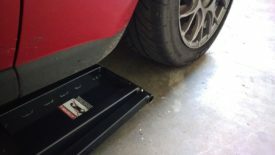 However, the Quickjack is pretty sturdy, and those cross bars come at a cost, which is impeding access to the bottom of the car. Also, using a hand drill geared down enough to lift a car is pretty slow. The real reason this is a terrible option though is the cost. At the time of this writing, it’s “on sale” for $1995 shipped, regularly $2245. This thing is simply way too expensive for what it does, in my opinion. It costs more than the MaxJax or Quickjack and is almost as expensive as a decent full-height lift. The MaxJax by Dannmar is a portable 2-post lift. A friend of mine recently got one. They cost between $1700 and $1900, depending on whether they’re on sale. The MaxJax has several good points. 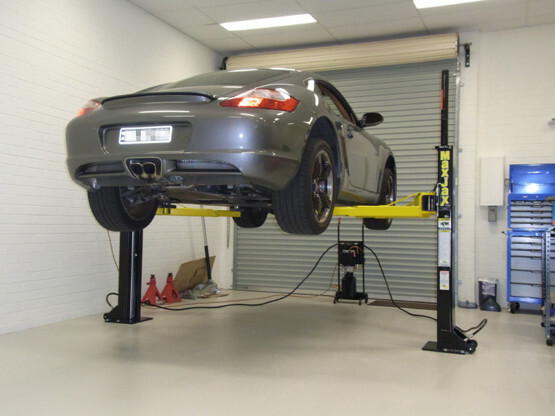 You can install it yourself, it’s not too expensive, and it is a legitimate two post lift. This was the strongest contender to the Quickjack for me. They’re also portable, unlike a traditional lift. The MaxJax system puts concrete anchors into your garage floor. You wheel each post over and bolt it to the anchors, and use the lift. When you’re done, you can roll them out of your way. I would imagine this is the most popular alternative to a Quickjack. Unfortunately, there were some dealbreakers for me. The biggest one is the concrete in my garage. MaxJax requires at least 4″ of concrete with no more than 0.35 degrees of slope. My garage floor is sloped pretty badly, at around 1.2 to 1.4 degrees left to right, and 2 degrees from to back. After calling a few concrete contractors to check prices on putting a level pad down, I gave up. By the time I got the work done, my $1700 would turn into $2500+. The MaxJax is cool, but not that cool. The MaxJax is also only a midrise lift, meaning it only lifts to about waist height. You essentially sit on a stool to get under the car. 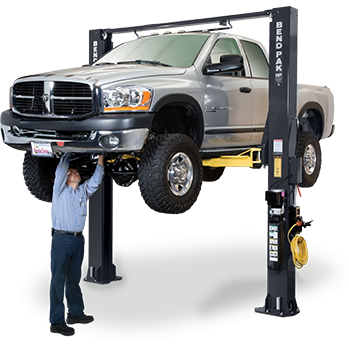 It flexes more than a full-height 2-post lift, as well. I think this is primarily because there is no crossbar over the top. It should also be noted this thing is a bit of a pain to install. You really want a true hammer drill, meaning the kind you rent from Home Depot, not the dinky hammer mode on your Ryobi. You’ve got to drill a bunch of holes in your concrete pretty precisely, and then you have to make sure you shim the posts to vertical when you’re done. You also need to hope your floor is actually evenly 4″ or more deep everywhere, which may not be true for older homes. In general, it sounds like the install takes a full weekend worth of effort. I strongly considered simply sticking with jack stands. They’re cheap and effective. However, the slope in my garage is such that a car on four jackstands will tripod, rocking corner to corner, and I’m not comfortable getting under a car in the air like that. The solution I used is to put two wheels on ramps, and two on jack stands, so the suspension takes up the difference. That gets old really quick, especially when the wheels need to come off one end. Ugh. I just got tired of it. I ended up going with the quickjack. Basically, you get two frames and a hydraulic pump. Two long hoses connect everything up, with quick disconnects. You can power it off 110 or 240 wall power, as I did, or 12V power if you want to take it to the track or otherwise use it portably. It’s really not a lift. It should be thought of as an alternative to a jack and jack stands. 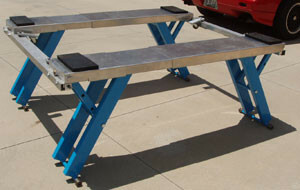 Specifically, it’s a much quicker, safer, and easier alternative to four jack stands. The picture shows my Miata lifted at max height with the provided 2″ blocks. They also include 4″ blocks, if I want to get it to the full 21″ high. They have a 3500#, 5000#, and 7000# version. Each version is heavier than the last, but supports more weight. 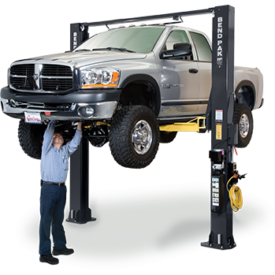 The one I got, the BL-5000SLX, lifts most cars up 5000# up to 21″ high, and seems to be the best general choice. If you’re racing spec miata and want a lift for track day, the 3500# 12V version would make more sense. See Quickjack’s website for details on the models. There are a number of points I like about this. It’s the easiest to store of all the options listed above. The frames can be leaned against the wall out of the way. That leaves the power unit and two long hoses, which are pretty compact and easy to store. It gets all four wheels off the ground and is stable. All the important parts of the car are accessible. Suspension work and tire rotations become much easier, and dropping exhaust or transmission components is safer and easier as well. It’s quite sturdy, although I can get it to wobble a slight bit if I push against it. Also, the revised 5000# model works with my Mustang and Miata, as well as my wife’s Camry. It doesn’t work with the F-150, as it’s too heavy, but I don’t really plan to do major work on that car anyway. The biggest problem with it is the price. It’s $1340 for the model I got, direct from quickjack.com. 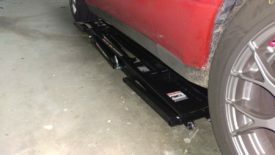 It’s pretty easy to call it a much better deal than the Ezcarlift, but there it is. It’s worth noting that if you call customer service and have patience, they can sell any open box returns at a discounted price. When the quickjack is at the higher of its two lock positions, I noticed I can get the car to wobble a bit if I push pretty hard on it. I think this is a lack of transverse stability since the two frames aren’t connected. The MaxJax appears to have the exact same problem. I suspect this is one area the Ezcarlift is actually better at. Still, I’m not worried the car is going to fall on me, as the wobble is barely noticeable. It does not budge an inch at the lower locking position. Apparently, there used to be issues with hydraulic fluid spilling when the hoses were disconnected. The new version has updated quick disconnects, and I have personally had zero problems with this. Will a BL-5000SLX Fit an NA Miata? This question drove me nuts. The short answer is yes, per the pictures above. I guess I gave that away by showing pictures of the Miata in earlier sections. The longer answer is that Quickjack’s old 5000# model had a 69″ frame. It could lift any Miata. They updated it to the 5000SLX, which was 72.5″. This can be used with NC and ND Miatas, and might barely clear NB Miatas, but did not work with NA miatas. (NA meaning 1990-1997). However, the good news! 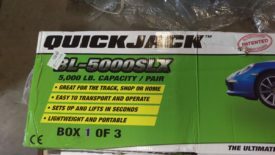 Quickjack updated the 5000SLX to be 70″ long this past summer (2017). The pictures above show this new version under my 97 miata. As you can see, with the Quickjack pressed against the rear tire, there is plenty of room for the frames to come up and lift the car. 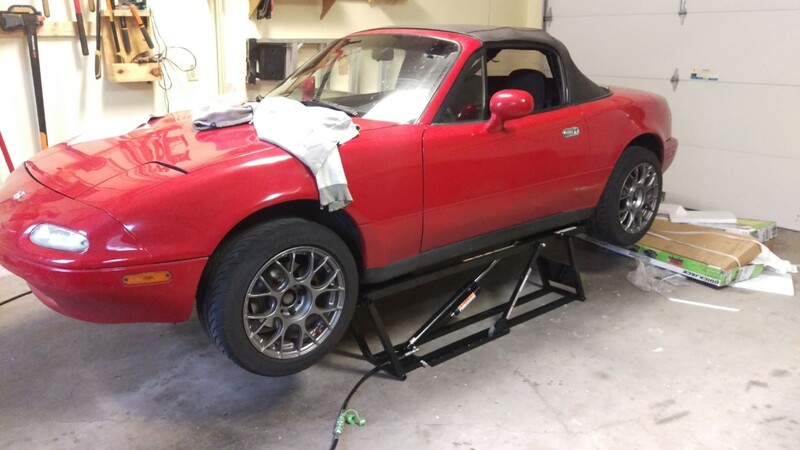 This is such good news because the 3500# unit, while it always fits Miatas, is usually too short to fit other cars, even if they’re small enough to be under the 3500# weight limit. So, how hard is installing it? I have detailed instructions in my setup guide, but it took me about an hour. You’re basically just getting the hydraulic fittings installed and adding fluid. Functionally, I really like the Quickjack. It gets the car in the air with all 4 wheels off the ground much more safely and quickly than a jack and jack stands ever could. The part that still gets me is the price. 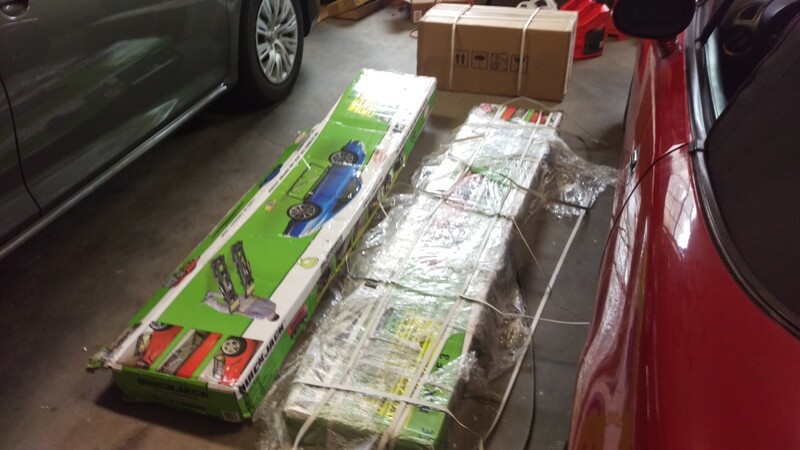 Honestly, I think the 5000# model is worth it if it works with multiple cars in your garage, you can’t install a MaxJax or full lift for reasons like mine, and especially if you can get a discounted open box unit. I gotta say though, now that I have one, I do not want to go back to jack stands. I’ll try to update this post with my impressions after using it for a few months. Yes, you’re absolutely right, thanks for the catch! The old BL-5000 was 69″, the 5000SLX that followed was 72.5″, and the newest version is 70″ (and is short enough to lift an NA miata, where the 72.5″ version was too long.) I’ve fixed the article.